We offer a range of services including general servicing, oil and filter change to full valve clearance, suspension refresh. From 8.30am-5.30pm Monday – Friday or 9am-1pm Saturdays. 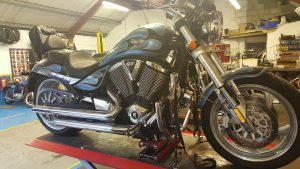 Phone the workshop on 01935 472665 or mobile 07500801398 to book your Motorcycle in for a service, MOT or related work. With many years of experience . and have accumulated a wealth of skill, knowledge and equipment, that would be hard to match anywhere, have both the facilities and the skills to carry out virtually any repair on any motorcycle or ATV. If you are considering using us for your repairs and servicing, please help us to help you by having certain information available when you call us. For instance, if you want us to quote you for a service on a 4-stroke bike it would be helpful if you could try and establish when (if ever!) the valve clerances were last checked as this often constitutes half of the work on a 4-stroke service and on most models, is not required at every service. If you don’t know when they were last done we will assume never as this is a very important part of the service that is often skipped by less reputable workshops. People often seem to think that a service is a magic “cure-all. If your bike has a specific fault maybe it needs the fault repairing, as well as, a service. If you are not sure – ask. We will be able to tell you whether the fault is likely to be rectified by the service or whether it will need to be dealt with as an extra item. A complete carburettor cleaning service, all makes can be cleaned by using our ultrasonic tank. Call in and ask for details or call us.